Take the opportunity to customize your lesson by requesting specific skills that you want to master. Below are some examples of popular requests and skills (with images to help) that we think make mountain biking totally radical. If you are not sure what skills to ask for or what you need... No worries! Angi is a professional at assessing riders on the bike and after a quick consultation so she is happy to advise or plan the lesson for you. Learn to catch some air! (and land safely) / Bunny Hops – Dynamic wheel lifts and weight shifts needed for jumping over obstacles. Learning how to progress to larger, non-rollable drops by catching some air and landing safely / Step-downs - A type of jump where the landing is lower than the take-off. 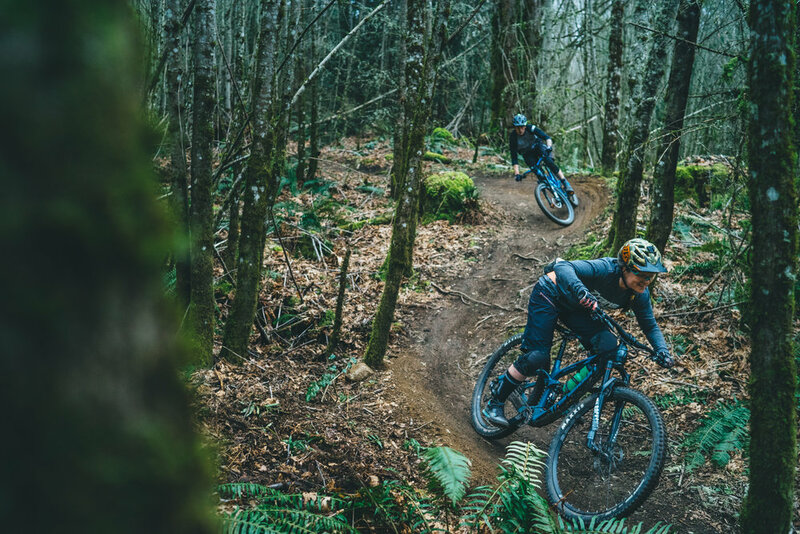 Lessons in line choice, proper braking, and controlling the bike on steep and often uneven terrain / Roll Downs - Riding small drops or ledges that can be rolled down without lifting the front wheel into the air. 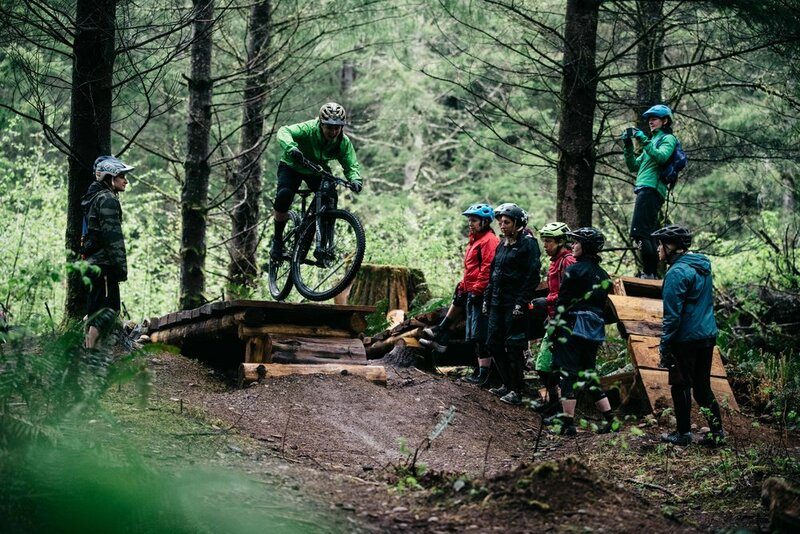 The certification courses that exist for mtb coaches cover riding concepts in depth but often lack valuable teaching and service concepts that really make for a great coach. Angi has developed riding and teaching intensive courses for coaches who want to improve their teaching techniques and step-up their riding too. Expanding on basic cornering skills to find success in a variety of turns (flat, bermed, high speed, switchbacks, etc) while working to be more dynamic, increase your speed, and/or confidence. Lessons in a variety of climbing skills (seated, standing, and crouched) with a focus on techniques like proper shifting and cadence, efficient body movements, controlled breathing, and line choice. We love riding bikes with kids! Our fun and energetic approach has been shown to keep kids entertained while progressing their skills. Having solid riding technique is a huge part of preparing for successful racing. Let us help you be more confident and calculated on your bike so that when you have to tackle a race track you know just what to do. DESCENDING STEEP TERRAIN/ROLL DOWNS: Lessons in line choice, proper braking, and controlling the bike on steep and often uneven terrain / Roll Downs: Riding small drops or ledges that can be rolled down without lifting the front wheel into the air. DROPS/STEP-DOWNS: Learning how to progress to larger, non-rollable drops by catching some air and landing safely / Step-Downs: A type of jump where the landing is lower than the take-off. JUMPS/BUNNY HOPS: Learn to catch some air! (and land safely) / Bunny Hops: Dynamic wheel lifts and weight shifts needed for jumping over obstacles. ADVANCED CORNERING: Expanding on basic cornering skills to find success in a variety of turns (flat, bermed, high speed, switchbacks, etc) while working to be more dynamic, increase your speed, and/or confidence. CLIMBING: Lessons in a variety of climbing skills (seated, standing, and crouched) with a focus on techniques like proper shifting and cadence, efficient body movements, controlled breathing, and line choice. COACHES TRAINING: Great for new or aspiring coaches to hone their own teaching and riding skills. With teaching and riding-intensive options these lessons are designed to supplement what you already know about teaching mountain bike skills by digging deeper into advanced riding techniques and/or subjects such as the science of learning, handling ability splits, writing lesson plans, adding fun into your lessons, and the psychology of facing fears. ROOTLET (KIDS) RIDES: We love riding bikes with kids! Our fun and energetic approach has been shown to keep kids entertained while progressing their skills. FOUNDATIONAL SKILLS: We all have to start somewhere and this session will ensure that you start safely by building your foundation for optimal growth. RACE STRATEGY: Having solid riding technique is a huge part of preparing for successful racing. Let us help you be more confident and calculated on your bike so that when you have to tackle a race track you know just what to do.